Here is How to Deal With Frozen Pipes! After this latest cold spell here in Colorado, many of you may be recovering from the thaw of frozen water pipes. Ben Franklin said it well with, “An ounce of prevention is worth a pound of cure.” Unfortunately that doesn’t mean much when you’re facing water damage and a foot of standing water. 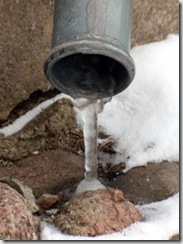 If you have a frozen water pipe, try running a little water through it. Is there any flow? If so, keep the flow going to help thaw out the pipe faster. The quicker you can get things back to normal, the better. While water is your first step, you can also use heat. Try setting a space heater directly facing the pipe. Don’t have a space heater? Try a hair drier. Both will point heat directly at the problem. After the pipe has been thawed, check carefully for any leaks or cracks. Freezing can stretch and change the pipe, and might produce tiny flaws that aren’t visible at first, but can lead to bigger problems in the short term. This is also where a good plumber can help. They are trained to look for these tiny problems, and can help evaluate if you have a problem-in-waiting, and how to prevent a future freeze. If you have one freeze, you may choose to evaluate the rest of your pipes as well. One problem indicates you may have others. Insulate pipes well, and keep a close eye on everything, especially during these cold, winter months.